If you are in the New York City area I highly recommend taking a class at Textile Arts Center. There is a location in Brooklyn and another in Manhattan. 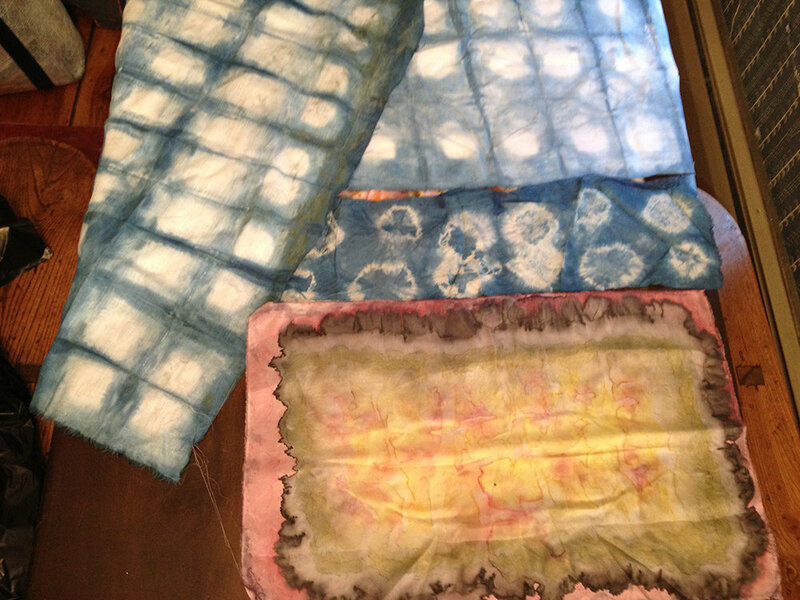 This past weekend I took a Natural Dyeing workshop led by Isa Rodrigues. She has a vast knowledge of the subject including the chemistry that makes all the magic happen. Here is some of the natural dyestuffs we uses including: coreopsis, weld, black hollyhocks, onion skis, monarda and purple basil. Here is a pot with simmering coreopsis flowers waiting for the fibers to be added. Our completed fabric and yarn samples. The orange/red is madder root, the yellow is coreopsis, the blue is black hollyhock, the bright pink/red is cochenille and the brown is walnut hulls. The most surprising is the cochenille which is a small bug that lives on cactus plants. It is a greyish color, but dyes this wonderful bright pink. and more samples. The blue ones are indigo which is a magical process. The blue color only appears after the fabric is taken out of the dye bath and the process of oxidation takes place.